The Fellowship was fortunate enough to obtain a copy of ALIENS: DEFIANCE #1 from Dark Horse Comics. Brian Wood writes, Tristan Jones draws, Dan Jackson colors, and Nate Piekos of Blambot letters. Zula is a Colonial Marine, and she’s just coming off of a nasty injury rehab. Her warm-up assignment is to accompany a group of Company security drones to check out a derelict ship. But the ship is not unoccupied, and Zula’s suit gets ruptured. The drones save her and stick her in stasis, and when they wake her, they have “gotten creative” with their orders. The Company is still the Company, but Zula is a soldier and the synthetics are ever curious. They’re pretty sure the Company knew what was on the ship, and they don’t like the implications of that at all. So this is an interesting twist on an Aliens story, and it has some real potential, not to mention a bunch of layers. And the art is just brilliant, with beautiful xenomorphs and exterior ship shots. The thing I respect about this issue (if I can limit it to one thing) is that as pretty as the xenomorphs are, the book doesn’t have us swimming in them. Which means they can be scary again. I love that. 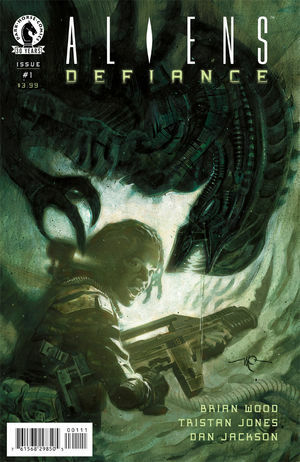 ALIENS: DEFIANCE #1 is available now at your FLCS or at darkhorse.com.